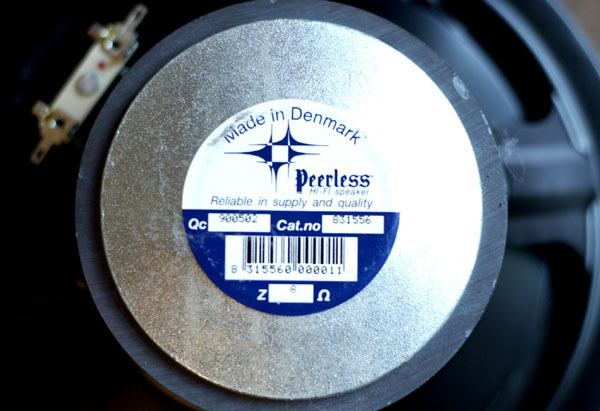 Until three or four years ago, I didn’t know that those classic speakers that appear to be blown out can be repaired. The problem isn’t as ugly as it looks. 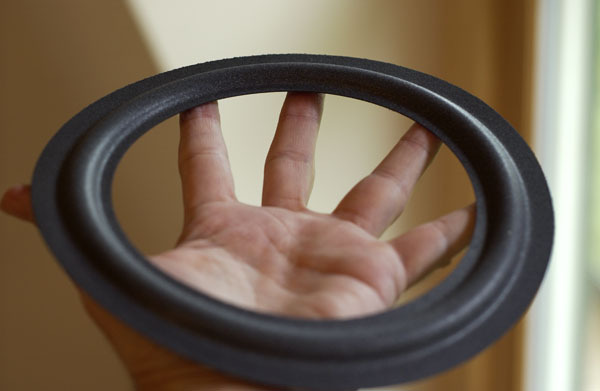 To keep an airtight seal between the front and back of the speaker, the outside of the speaker has a plastic foam “surround.” These surrounds have a life of 10 to 20 years before they must be replaced. 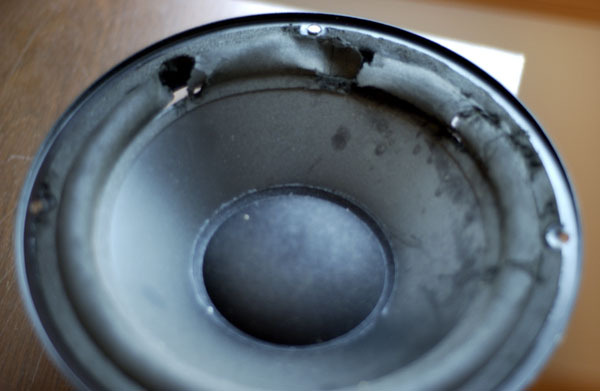 When speakers have blown-out surrounds, it doesn’t mean that they’ve been abused. It’s just that the foam gradually decomposes from exposure to the air. 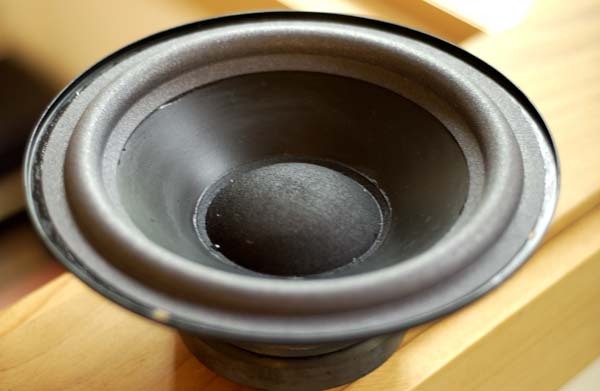 The repair job involves carefully removing the old surrounds, cleaning the glue and foam residue off the surfaces, and gluing a new surround onto the speaker. Surrounds can be bought on-line. I bought my from Parts Express. 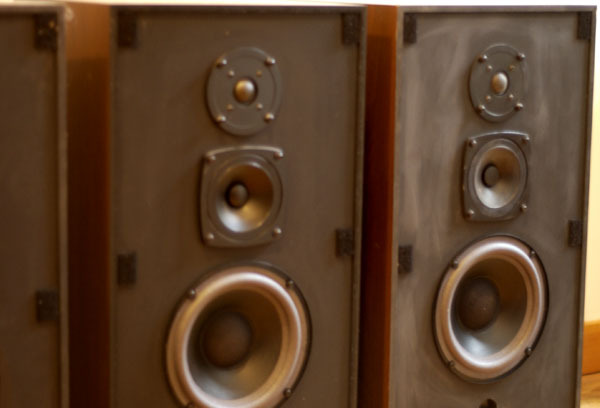 If you want to undertake the restoration of a speaker, you have some research to do. First you need to determine the correct surrounds to order. And though the restoration kits come with instructions, it’s a good idea to watch some YouTube videos of the process. The abbey’s new organ, a Rodgers Cambridge 730 built in 1992, came with eight Rodgers FR1.7 speaker cabinets like the those in the photo above, plus two very large subwoofers to support the low pedal stops. Four of the FR1.7 speakers needed repair, a job that I’ve finally finished. Now as soon as I assemble some more speaker cables I’ll have the full complement of 10 speaker cabinets. That’s 500 pounds of speakers, almost equal to the weight of the organ console. That’s a heck of an audio system for a heck of an organ. I used to hesitate to call myself an audiophile, but I think I’ve earned the title, considering how much excellent (but vintage) audio equipment I have in the house. And now that I’ve been through the rite of passage of repairing speakers. I was pleased to see that the 8-inch speakers in the FR1.7 cabinets are Peerless speakers, made in Denmark. It made me realize how few Danish imports most Americans have. I love Denmark, having been there on two business trips. So I’m proud of the Danish speakers in my Rodgers organ. Rodgers organs, by the way, are made in Oregon. They are sometimes referred to as the Rolls-Royce of electronic organs. They use digitally sampled pipe sounds. When Rodgers organs are installed and adjusted properly, even organists think they’re listening to a pipe organ. This was written by daltoni. Posted on Wednesday, September 21, 2011, at 3:44 pm. Filed under Technology. Bookmark the permalink. Follow comments here with the RSS feed. Post a comment or leave a trackback. I hear you. The Allen vs. Rodgers debate has gone on for years. Perhaps it’s a matter of taste. But I wouldn’t give two cents for an Allen — at least most models of Allen.